When snowflakes fall, two sisters react in different ways. One is excited and the other is wary. The first sister spends the morning outdoors, playing until she's all tuckered out. Meanwhile, the second sister stays indoors, becoming ever more curious about the drifts outside. Soon, they switch places, and spend the second half of the day retracing each other's footsteps. But each sister puts her own unique spin on activities like sledding, baking and building. KERRI KOKIAS credits most of her story ideas to her "fly on the wall" personality. This means she's both a keen observer of social interactions and a nosey eavesdropper. 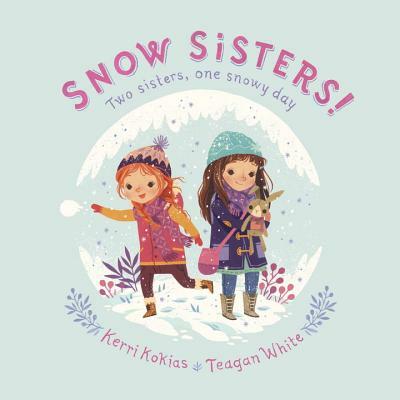 Snow Sisters is her first picture book. She lives in Seattle with her family. TEAGAN WHITE is a freelance illustrator specializing in playful watercolors and illustrated typography. Originally from Chicago, Teagan now lives and works in Minneapolis, where she received a BFA in illustration from the Minneapolis College of Art & Design in 2012. She has written and illustrated a variety of picture books including Adventures with Barefoot Critters and Amy Krouse Rosenthal's That's Me Loving You.